There is a first time for everything. This weekend, we made Indian food from scratch, for the first time. Not with sauce from a package or jar. I am so proud. This is also part of our effort to eat at least one vegetarian meal a week. Not just a meal with no meat, like a green salad or steamed broccoli , but something that is tasty, nutritious and somewhat balanced. I have had this little Indian cooking book for quite some time but I am daunted by the myriad of spices and ingredients unknown to me. Someday, I say, someday I will try this. That someday arrived this past weekend and we made a small investment in a great number of spices. We even managed to find fresh curry leaves but not black mustard seeds. We just substituted with brown mustard seeds. The black ones are supposed to be a bit more pungent but the brown ones worked just as well. 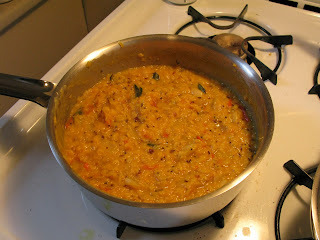 We chose red lentils because it cooks quickly and there is no prerequisite soaking. We ate it with basmati. Put the lentils in a heavy-based saucepan with 500mL (2 cups) water. Add the roughly chopped onion, tomato, creamed coconut or coconut milk, chillies, turmeric cumin and coriander, and bring to a boil. 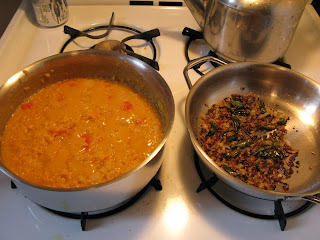 Simmer and cook, stirring occasionally until the lentils are cooked to a soft mush (masoor dal does not hold its shape when it cooks), about 25 minutes. If all the water has evaporated before the lentils are cooked, add an extra 125mL (1/2 cup) of boiling water. For the final seasoning (tarka), heat the oil in a small saucepan over low heat. 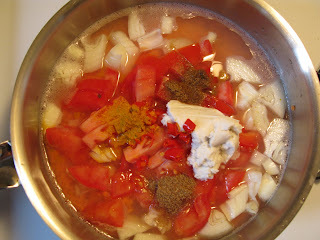 Add the cumin seeds and mustard seeds, cover and allow the seeds to pop. Add the finely chopped onion and curry leaves and fry over low heat until the onion is golden brown. Pour the seasoned onions into the simmering lentils. Season with salt, to taste, and cook for another 5 minutes.